This dish has a real wow factor because of the sensational pastry. It is crisp and flakey! So much better than anything you buy. It’s a bit fiddly but well worth it. You freeze the 220gm of butter and then grate it into 2 cups of flour, 1 t of baking powder and 1 t salt. Mix it with iced water, and rest it until you’re ready to roll and cut into rounds. 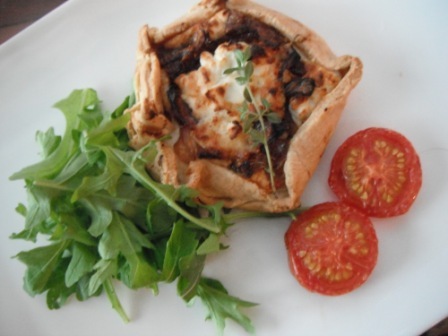 Put a pile of mixed goat’s cheese, feta and cheddar in the middle of the round and smother with caramelised onions. Pull in the sides of the rounds by pinching pastry. Then put another huge blob of the cheese mixture on the top. I can’t go past Soignon goat’s cheese. I could only get the spreadable version at the Supermercato today, but it worked really well. Yum! Looks and sounds deliciosa Heather.